Trying to see things from another's point of view can be an admirable trait. But when one sacrifices their own principles in the process, even if they believe it's for the right reasons, tragedy can result. This is the idea at the heart of Mara Nelson-Greenberg’s satire "Do You Feel Anger? 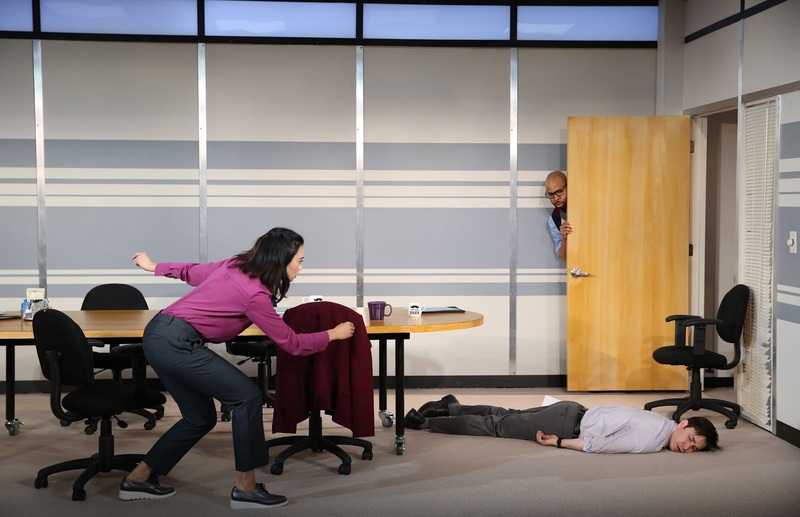 ", now having its New York premiere at the Vineyard Theatre. Sofia (Tiffany Villarin), is a so-called "empathy instructor". Someone companies hire to help their workers better understand the feelings of their customers; and through that process, hopefully develop insights into their own behavior. Sofia’s latest assignment is at a debt collection agency. One which has been the target of multiple lawsuits. At least some of which stem from the employees’ attitudes toward those they contact. It quickly becomes clear that the company in question is a misogynistic breeding ground for condescension. The employees' overall attitudes being basically that of immature high schoolers, with sexual innuendos and other crude comments the order of the day. Management, as personified by Jon (Greg Keller), being no better. They basically preferring a “hands-off” approach to the entire matter. Sofia's only ally is Eva (Megan Hill), one of the few apparent female members of the company, who offers her several veiled warnings on how to navigate the obstacles she will soon be face. Initially hitting a brick wall in her attempts to connect with the workers - via a series of visual and verbal exercises - Sofia decides to come at the problem from a different angle. She suddenly seeming to go along with their attitudes. Such as laughing at their obscene jokes and lewd drawings of women. Sofia then using these new-found bonds of familiarity to push her own agenda. Surprisingly, the men quickly respond to her new approach. This leading to some rather humorous moments as they begin to open up emotionally and try to realize the people on the other end of the phone are often more than simply financial deadbeats. At the same time Sofia is becoming “one of the boys” so to speak, she is just as quickly alienating Eva. Someone who, until now, has simply gone along with the attitudes of the rest of the office. Now however, thanks to Sofia’s presence, she is beginning to stand up for herself. Sofia’s subsequent actions being seen by Eva as a complete betrayal at a time she needs her support the most. This viewpoint shift is also visible in the clothes Sofia and Eva wear during the course of the play. When Sofia first arrives at the company, she is wearing a formal suit – only to be told that she should probably wear a dress. Sofia does appear in such attire soon after, with her outfits becoming ever more casual and loose fitting (i.e. a sweatshirt) as time goes on. Eva on the other hand, begins to wear garments that are more professional and austere during the course of the story. She and Sofia moving in opposite directions in terms of attitude and permissiveness. Nelson-Greenberg has come up with a fascinating idea here. The work showing, despite how far we think we may have come in terms of equality and basic decency, that we still have so much further to go. The piece also pointing out the importance of standing one’s ground when it comes to these issues, and not simply excusing them for the sake of expediency. No matter what the underlying reason for doing so may be. While we do get a good picture of the various employees, most of whom are stereotypical caricatures, we never get a clear idea of Sofia is, or what drives her. Without such insight, the audience is unable to see where she's coming from, and thus can't truly understand her. Which is rather ironic, as doing just that is the basis for the work Sofia does. The only thing we do know about Sofia is that her parents have just split up. She apparently either taking her father's side in the conflict, or simply refusing to deal with the matter at all. Though we only know this via a series of one-sided phone calls she receives from her increasingly distraught mother (Jeanne Sakata). Sofia choosing, for whatever reason, not to respond. 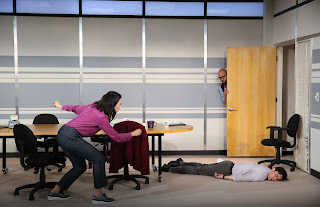 Another misstep occurs when, after laying out the basic scenario of the story, the playwright takes things in a completely new direction for the final scenes, pretty much upending everything that has gone before. The show going from a not-so-gentle poke at some serious issues, to a much harsher atmosphere; with no real explanation for the shift. Including the changing attitudes of some of the characters. The last scene in particular, meant to offer a moment of clarity by moving things completely into the metaphysical, feels more like a tacked-on afterthought. One which pretty much falls flat. The various performers all acquit themselves well. Justin Long stands out with a strong performance as a sexual objectifier, who changes from being from simply offensive to outright threatening at the drop of a hat. Also quite effective is Sakata, who delivers some rather heartfelt monologues as Sofia's Mother as she continually tries to plead her case. Margot Bordelon’s direction works nicely, but it's stymied by a weak script. Emilio Sosa does an excellent job with the costumes, particularly the different outfits Sofia and Eva wear. Laura Jellinek’s sets are good, with the final scenic effect being especially striking. Marie Yokoyama's lighting design works fine. Do You Feel Anger? is definitely a show with something important to say, but the final product is too disjointed - logistically and emotionally - to leave a lasting impression.